Lightning strikes next to Mount Sinabung volcano as it spews steam and ash on September 18, 2013. More than 15,000 people have now fled their homes since Mount Sinabung in western Indonesia spectacularly erupted this week, an official said Thursday. JAKARTA (AFP) – (AFP) – More than 15,000 people have now fled their homes since Mount Sinabung in western Indonesia spectacularly erupted this week, an official said Thursday. 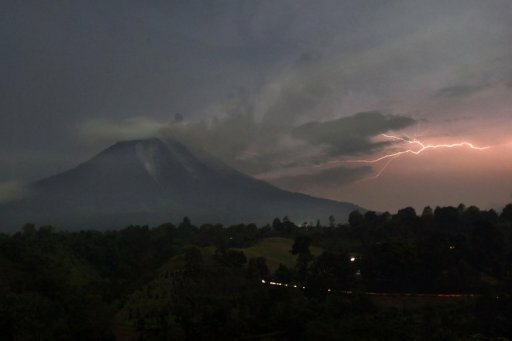 The volcano in North Sumatra province erupted for the first time in three years on Sunday, spewing rocks and red-hot ash onto nearby villages, and has been rumbling ever since. The volcano sent a column of smoke as high as three kilometres (two miles) into the sky on Tuesday, forcing villagers outside the immediate “danger” zone to flee. “So far, 15,281 people have been evacuated in 16 temporary shelters across Karo district,” district administration spokesman Robert Peranginangin told AFP. He said that some villagers, mostly men, had been returning to their homes by day to feed their cattle and returned to the shelters overnight. Authorities warned airlines to take care flying in the vicinity of the volcano, while some light aircraft were advised to avoid the area. The volcano had been dormant for nearly 100 years until it erupted in August and September 2010, forcing about 12,000 people to flee their homes. Indonesia has dozens of active volcanoes and straddles major tectonic fault lines known as the “Ring of Fire” between the Pacific and Indian oceans. Last month five people were killed and hundreds evacuated when a volcano on a tiny island in East Nusa Tenggara province erupted. The country’s most active volcano, Mount Merapi in central Java, killed more than 350 people in a series of violent eruptions in 2010.